Bridal shower invitations are your first contact with guests. You want to peak their interest, and have them looking forward to the upcoming event. Your invitations can make a statement by reflecting the type of bridal shower you are planning. You can do this by selecting your party colors, a picture that would indicate the theme, or any other appropriate design. • Themed bridal shower invitations can be found to coordinate with most party ideas. There are numerous designs, and they are relatively inexpensive. You will often find a whole line of items to match, simplifying the rest of your party plans. 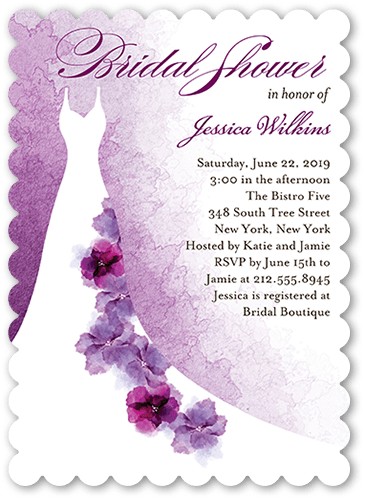 • Unique Bridal Shower invitations are available at Wedding Paper Divas. They carry a variety of high quality designs. Choose one that reflects your party plans. You will be given the choice to customize your design with personalized text. Matching "Thank You" notes are also available. to announce your event. Imagine your guests faces when they open the mailbox to find this type of invite. It will definitely be a conversation piece up until the day of the party, and remembered long afterwards. 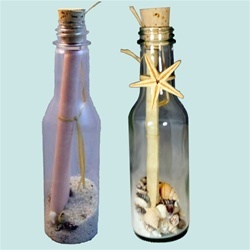 These are available in both glass and plastic in several choices. They can be sent through the mail. • Want to make your own invitation? These kits make it super easy saving you time and money. Anything you do yourself always adds a personal touch. If you are making or printing your own, you'll need to decide on your wording. Sometimes, we get our best ideas by browsing. Take a look at sample wording. Have Questions About Bridal Shower Invitations? • When should they be sent? Four to six weeks in advance of the party. This gives your guests plenty of time to mark their calendars, make any necessary plans, and respond. *** If most of your guests are from another state (or even another country), give them as much notice as possible. • What information should be included? The who, what, when, where, and why should be given. Tell guests all the basic facts about the party. You can explain the theme, if there is one. You may also want to enclose directions. • Should I add the bridal shower registry? This is often debated. Some guests love the idea, as it makes gift buying easier. Others consider it "asking for gifts". So, this addition is really a judgment call on your part. Are there any do's and don'ts when it comes to your invites? • Invitation etiquette questions you may have. • Insert some confetti inside the invitation for a fun surprise. There are designs available to go with many themes. It can also be geared toward your party colors. • Add a decorative seal for that extra special touch. • Another creative yet inexpensive idea, is to add clip art to your invitation, or envelope. Use designs that relate to your party style. • With PhotoStamps you can turn your own digital photos into real US postage! Create yours today. Use a picture of the bride or couple, on your envelope, for that extra special touch. How about a childhood picture? • Thank you notes add convenience and continuity to your planning. Purchase them ahead of time, to be given to the "guest of honor". The day of the bridal shower, give the thank you notes, along with a list of gifts received and who gave them. This simple gesture will be greatly appreciated. Whether simple or elegant, your bridal shower invitations should peak your guests' interest, and help them look forward to a special event.